Schools speech contest got under way. This contest has been the passion of Rotarian David Knight since its inception with Sarah Jenner from Discovery School co-ordinating all the children and schools. 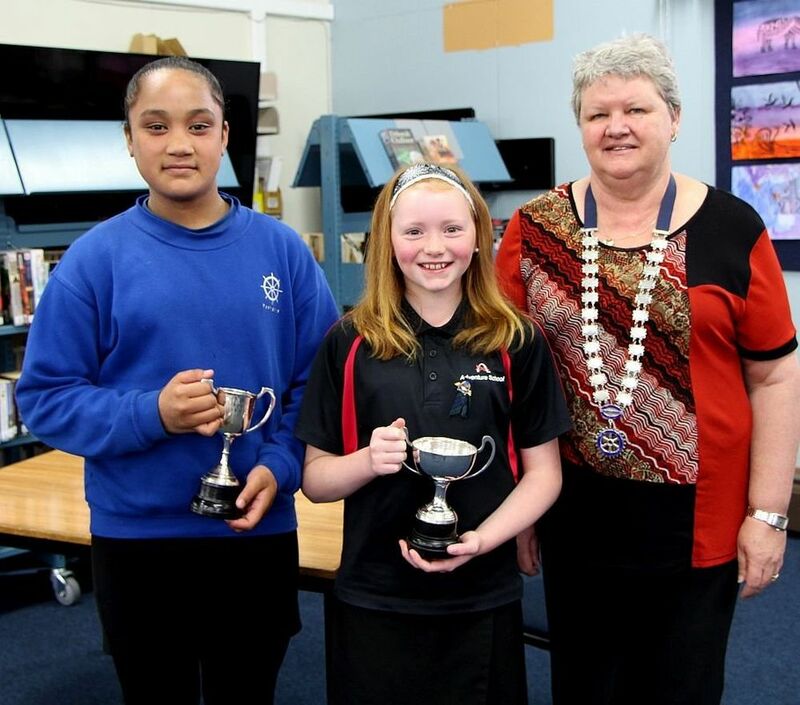 The Parumoana schools cluster comprises the nine primary schools between Whitby and Pukerua Bay, and between them they entered 17 children for the contest. 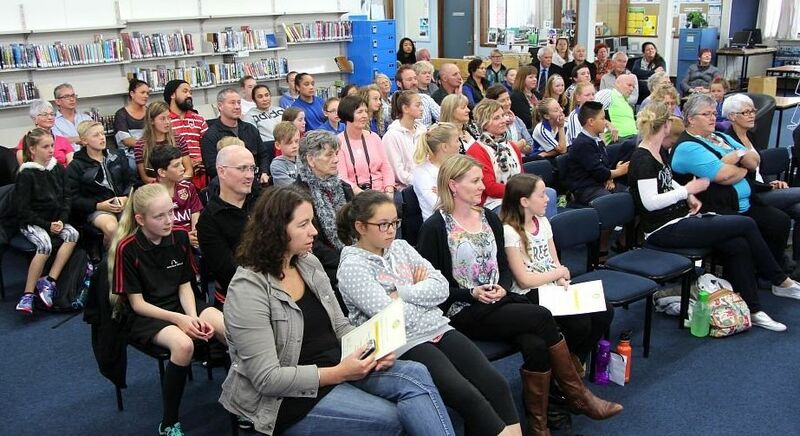 As usual, they were divided into two categories, years 5&6 (aged 10 and 11), and years 7&8 (aged 12 and 13). The contestants were asked to speak for up to four minutes on a topic of their own choosing. What a contest it was! The old hands agreed the standard was higher than ever. The subjects were well chosen and well-researched, and the delivery in many cases was extraordinarily good - prompting President Adrienne to remark that bright futures beckoned on the stage or in the law courts. Our club was well-represented; David Knight made sure it all went without a hitch, Wendy Betteridge and Velma Knight were on the judging panel along with Carol Dring (a former Toastmaster), and President Adrienne presented the trophies. Like most Rotary projects, this was an uplifting event, but it raised a question in my mind. Clearly, today’s eleven-year-olds have the communication skills of yesterday’s sixteen-year-olds. Where will it all end? 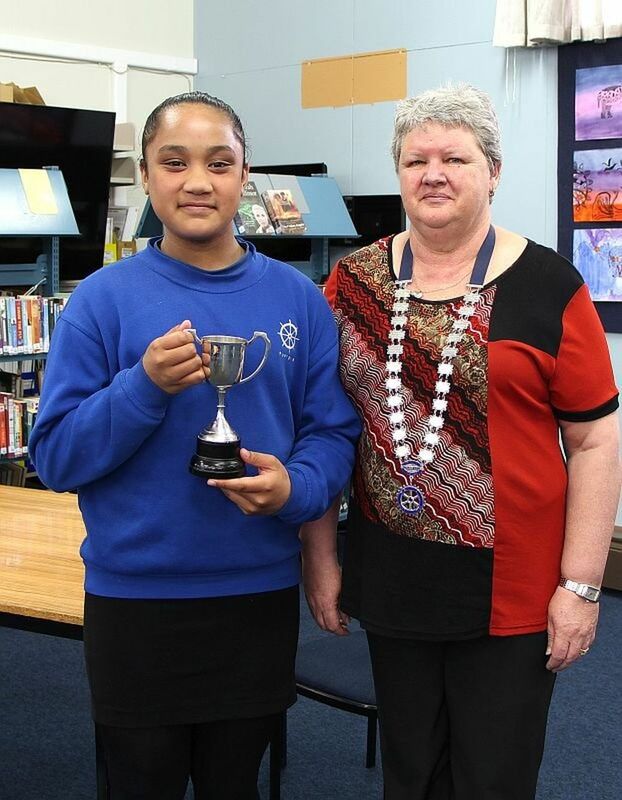 When Sophie Crozier, who subsequently won the Year 5&6 contest, arrived at the Aotea Library, we were delighted to see that she was proudly wearing the Rotary pin that Mayor Nick Leggett had awarded to her at the Primary School Leadership awards in September. She told us that she wears it nearly every day. Miracle Suailua's speech was very moving. She has kindly agreed to allow us to reproduce it here. It started and finished with a poem and she delivered it without a note. the hurt they make they can't get away. creating havoc is their dream. mums, dads, kids out for fun. doesn't matter they think they're great'. 'This should never be the case, cyber bullying is not okay. 'Hi, my name is Miracle and I am going to talk to you about what cyberbullying is, how much of an impact it has on our society and how we can stop being silent about cyber bullying. 'Cyber bullying is when someone is tormented, threatened, harassed, humiliated, embarrassed or otherwise targeted by people who hide behind a screen of anonymity online. Cyber bullies do not need direct physical access to do unimaginable harm to their victims, because they use social media like facebook, twitter, Instagram, snap chat, to hunt and approach them. 'Cyber bullying has a huge impact on our society. 52% of teenagers get cyber bullied and around 4,500 kids commit suicide each year because of it. Amanda Todd was a victim of cyberbullying, she was also one of the 4,500 kids who committed suicide in 2012. But Amanda's story of herself being stalked and harassed went viral. 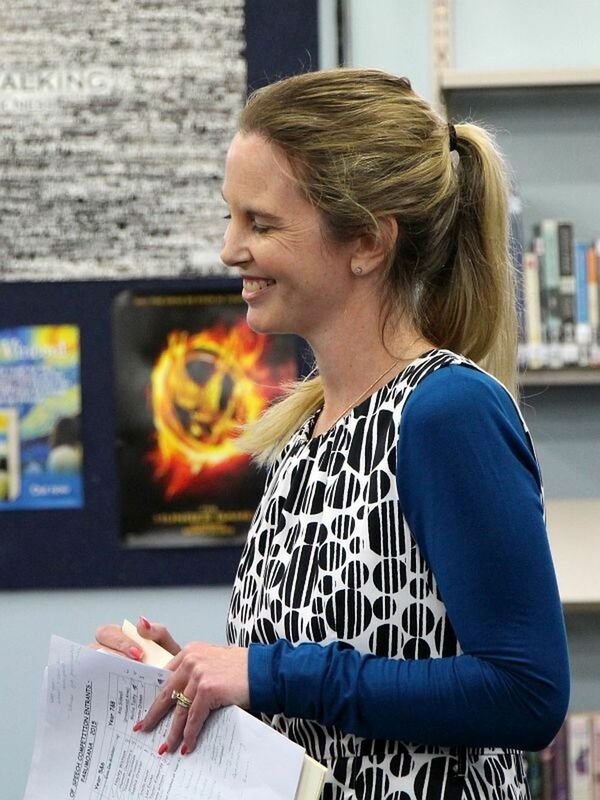 Because she narrated her story of how she used self harm, drugs and alcohol in an attempt to silence the pain she was suffering as well as cyber bullying. But because of her courage over 17 million people viewed her video and made 2 huge campaigns called 'No bullying', and 'to be someone' campaign. To help stop cyber bullying. 'Now yous guy's probably never knew this but silence is agreement, and statistics show that 95% of teenagers who witness cyber bullying ignore the behaviour. So now that you know, here are three simple steps that'll help us to stop being silent about cyber bullying. 1. Be a friend not a bystander. Just watching someone getting cyber bullied empowers an aggressor and hurts the victim even more, so report the behavior. 2. Pause before you post. Convince others and yourself not to post anything that could compromise their reputation, because people judge you on how you appear to them. 'In conclusion I'd like to end off with a poem that encourages us to speak up for those who can't. pretending you have nothing to say. who knew that words could be so very deadly? never truly knowing that someone is in need. don't dent what the eyes to your soul have revealed to you. stop bypassing it pretending it's a secret. Original generation time 1.4968 seconds. Cache Loaded in: 0.0278 seconds.